Types of wines: A modest, rustic, medium-bodied, flavorful red when vinified simply. Bold, robust and richly flavored when it is carefully grown and fermented and aged in small oak barrels. It can also produce fragrant, full-flavored, dry rosés. 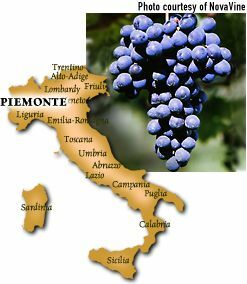 Origin: Barbera is the most widely planted grape in Piemonte, where it is grown in a number of Denominazione di Origine Controllata (DOCs), such as BARBERA d' ALBA and BARBERA d' ASTI, high-quality growing regions where varieties and yields are regulated by the government. Long considered distinctly inferior to Nebbiolo, Barbera is growing in reputation, with some renditions challenging the best of Barolo and Barberesco. Description: Simple, inexpensive Barberas deliver bright plum and black cherry aromas and flavors with crisp acidity and soft tannins. More serious renditions offer a dark purple color with ripe black fruit aromas and a beefy, almost decadent flavor. Naturally high in acidity, but low in tannins, Barbera responds well to oak, which can impart rich smoke and vanilla tones. Dry rosés often exhibit the same aromatic and taste properties of the simple reds, but are lighter in body and crisper on the palate. Aging: A very good candidate for cellaring: even the most modest Barbera will improve within two to three years. The more complex releases will undoubtedly improve for five to ten years. The wine can acquire charm and elegance as it drops its cloak of acidity and reveals the fullness of the marriage of fruit and oak. Drink the rosé Barberas young but don't be surprised at how a two-year-old can develop more substance. Best location: Naturally high acidity make it a very desirable grape for hotter climates, where it can be easily grown to balance over-ripeness. However, those areas that afford the vine temperature variations of hot days and cool nights can be expected to be sources for intrinsically finer fruit. FastFoodFacts: Pizza, burgers, barbecue, sausages, salamis and other foods with higher fat content for the smaller wines. For the bigger wines: savory stews with root vegetables, roasted cuts of beef and venison, grilled wild mushrooms and hard, aged sharp cheeses including Parmiggiano and Asiago. For the rosés: enjoy as an aperitivo or match with simply prepared (even raw) shellfish and, of course, sushi.